If you are an AmiBroker user, we have programmed the add-on code for Trading New Highs from Buy the Fear, Sell the Greed. Please Note: This purchase provides you with the AmiBroker add-on code for the Trading New Highs strategy only. 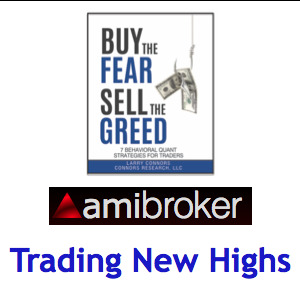 If you would like to purchase the AmiBroker add-on that contains the entire set of seven Buy the Fear, Sell the Greed strategies for $125, click here.